The title of the this blog post, “Here’s a question that will be on the 2017 AP Chemistry Exam” should really be accompanied by the subtitle, “Wild speculation that will mot likely prove to be completely wrong!” – but it’s fun. right? So what’s this all about? 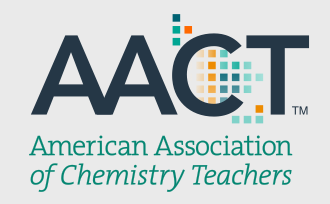 It has become customary for Paul Price, co-chair of the College Board’s AP Chemistry Test Development Committee (TDC), to deliver a webinar, via the AACT (American Association of Chemistry Teachers), in April of each year. I listen to these broadcasts intently. Paul has yet to say anything that I don’t know, BUT his tone and the specific content of what he offers each April, are of great interest to me. I believe that his comments have at least the potential to offer up some insight into what the TDC are thinking at any given point in time. Wouldn’t you like to know what they are thinking about the 2017 AP Chemistry Exam? I know I would. Following Paul’s April 2015 presentation, I wrote this blog post. It turned out that on the “secure” (LOL! ), 2015 International Exam that year, there was a question that featured the obscure, never before seen reference, to microwaves. How did I guess that? By simply being acutely tuned in to the exam, and the people around it, and by applying a critical ear to Paul’s words. In 2016, I didn’t draw anything from Paul’s webinar that I thought might be a clue to an exam question, so I did not make any predictions, but I did write this post. When you read that post, you’ll see that I wrote, “He (Paul) went on to make several other minor points that confirmed things that I already knew including…that complex ions could easily be used in an equilibrium context…“. Given what happened on question 6 in 2016 on the operational exam, I’d say that although that wasn’t anything that we didn’t already know, it was a pretty interesting observation! Ironically, 2016, 6 proved to be one of the inspirations for Paul’s latest webinar, that he entitled, “Big K, Small K, and Buffers: Merging Equilibrium with Limiting Reactant“. As part of this year’s webinar, Paul made a number of points that I made in my blog post from 10 months earlier, entitled, “All Creatures Great and Small and 2016, 6” – the similarities between the points I made there and a number of Paul’s points are striking, which included direct references to huge and tiny K’s, and 2016, 6! Anyway, to the point. What did I see in the 2017 webinar that caught my eye? As I said above, there was nothing ‘new’ per se, but two things did stand out for me. Firstly, I saw multiple references to the use of K to prove that a neutralization reaction is one that goes to completion. Now, let’s just take a moment to unravel that one, because there is a reason beyond the fact that Paul mentioned it multiple times during this presentation, that this got my attention. That massive value for K answers the practice exam question. Now, all of that is not especially earth shattering in terms of the chemistry, but it struck me as odd the first time that I saw it, and Paul’s recent, multiple references to the same (including the use of the value of 1 x 1028 for the ‘doubled’, hence K squared, version of the net ionic equation for neutralization), definitely piqued my interest. The second thing that came up in the webinar is something that for whatever reason, has been swirling around various AP chemistry teacher communities for some time now. I don’t know the origin of the “rumor”, or if there is any substance to it, but lots of people have been talking about the possibility of this type of question coming up. I should add, that this speculation was taking place long before Paul’s most recent webinar, so when he talked about it as well, my ears really pricked up! OK, what are we talking about here? Simply put, the marriage of the TDC’s obsession with particulate diagrams, and some kind of titration curve, probably one with a weak component. What does this mean in practical terms? Well, here’s a good example of what I’m talking about, and I know that the educationalist amongst you (rather than the chemists), love this POGIL nonsense! Let’s unpack this a little. and later the marriage between those diagrams and the titration curve. There isn’t really anything on that whole worksheet that any competent AP Chemistry teacher (or indeed competent AP chemistry student) couldn’t work out, but there are a couple of things that I think are worth mentioning. One is the idea that particulate diagrams have some significant limitations. For example, when representing a weak acid in solution, to accurately do this in a truly quantitative manner, for a 1% dissociated acid (not atypical), we would need 99 associated particles for every 1 dissociated. Diagrams that include 100, drawn particles are practically difficult to create and interpret so perhaps such a diagram would show zero dissociated acid molecules. Secondly, the there is an interesting question that could come up in relation to particles and pH past the equivalence point. 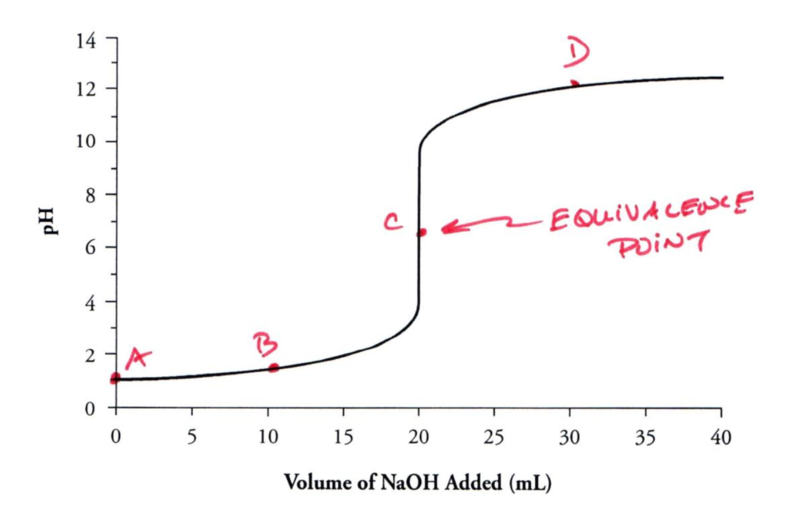 Take for example a titration of 20.0 mL of 0.01 M CH3COOH with 21.0 mL of 0.01 M NaOH. 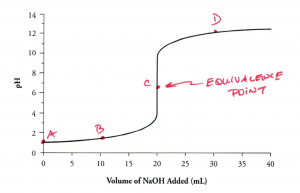 As we know, the way to calculate the pH past the equivalence point is to disregard the relevance of the weak, conjugate base, CH3COO–, and to only consider the excess strong base (much like questions 11 (c)-(f) on the POGIL worksheet). That’s all well and good, but here’s a question to ponder. What is the species in solution with the greatest concentration when 21.0 mL of the base have been added? Saving you the pain of the calculations, it’s CH3COO– and not OH–, and perhaps a jolt to the sense that might otherwise have thought it would be OH–. OK, so there you have it, a bunch of potentially useless speculation – you’re welcome!